24/7 Professional Drain Relining Experts in Melbourne | Save $50 Today! We are Melbourne’s Pipe & Drain Relining experts. We’ll fix your pipe problems fast & cost effectively, without digging up your yard or ruining your landscape, saving you both time & money. Call Revive a Drain today to secure your FREE onsite consultation. We don't need to charge call out fees because we do good work, our prices are reasonable and we offer the best solutions. Our plumbers work 24/7 so we can help you unblocked or repair your drains whenever you need us most. Because we've been doing this for so long, our team of licensed plumbers are highly trained in advanced relining techniques. Drain relining (also known as pipe relining) is an advanced and more affordable way to repair & unclog blocked drains! It works by lining the inner surfaces of the drains and pipes with a strong & powerful resin. Once hardened, the relined drain is stronger than the original because of how tough the resin used is. 80% of drains can be repaired using drain relining without digging. This makes the process far more affordable AND less time consuming than older drain repair techniques. See our 4 step process below for more details. To book a drain relining appointment, call Revive a Drain today. Director Aaron Robb performing our famous blocked drains & drain relining services. Step 1: Unblock – The first step is to remove & clean any blockages from the damaged pipe using a high pressure jet blaster. The jet blaster is capable of removing (almost) EVERYTHING, including root systems, soil, debris, etc. 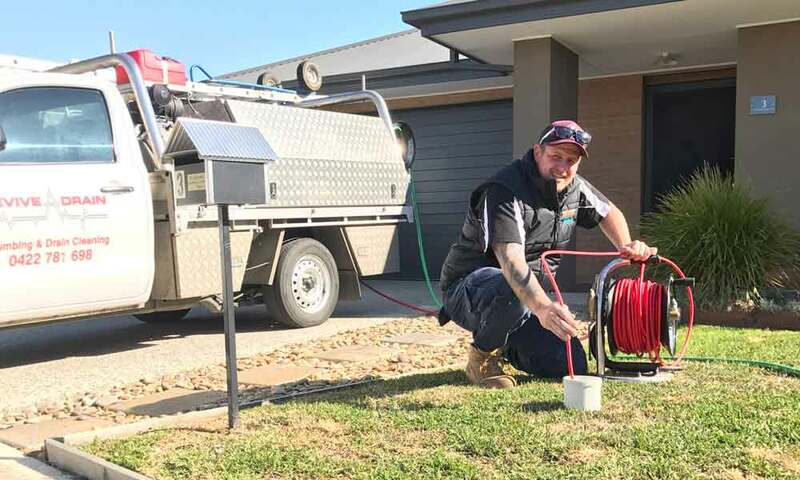 Step 2: Inspect – After the drain has been cleared, we use our CCTV drain inspection equipment to determine the cause of the blocked/damaged drain and pinpoint the location of the issue with 100% accuracy. Step 3: Insert – From there, we measure & then prepare our advanced relining equipment to insert the patch into the pipe. We have years of experience relining pipes & drains, so we know how to get this part right. Step 4: Check – 2 hours later, the completed relining patch permanently repairs the damaged pipe. See the difference by looking at the before & after photo below! The numerous benefits of pipe relining make it a no-brainer for all your drains that need repairing. One of the best things about using drain relining to repair damaged & blocked drains is that we don’t need to dig! 80% of the time, no excavation is necessary. That means no more having to pull up your driveway or rip out your garden bed, so your place will look exactly the same before & after our drain relining service. Regardless of the length or size of the drain, pipe relining works. We can reline stormwater drains, sewers, bends, junctions, cast iron drains and pipes from 50mm to 400mm in diameter. Drain relining is very flexible when used in the right hands. The biggest benefit of our drain relining service is that it’s going to save YOU money. We’re able to repair damaged drains much faster than older methods which leads to less time on site & more money in your pocket. Also, because the re-lined drains are more durable than the original drain, you’ll save money in the long run on future repairs & problems! We’re so confident that you’ll love our work, that it comes with a 15 year guarantee! No more worrying about having to constantly repair old, outdated, and damaged drains. We’ll come in, fix the problem so you won’t have to think about it for at least another 15 years – our guarantee! For Fast Drain Relining Services In Melbourne, Call Now! In almost all cases, we recommend relining drains instead of replacing them. It works out to be a cheaper, faster and less intrusive solution because in most cases, we won’t need to dig. What type of pipes can be relined? We can reline any type of drain, from sewers to stormwater to regular pipes, as long as they’re between 50mm & 400mm in diametre. How do I know pipe relining will fix my problem? Before we do any work, our experts will perform a thorough check with an advanced CCTV drain camera to check if there’s any damage and whether or not relining will be sufficient to fix it. We’ll happily show you a visual as we perform the check too. As much as we’d love to give you an upfront price, it’s too difficult as every job is different. However, for your peace of mind, we have no call out fees so we can give you a quick initial assessment before we perform & charge you for any work. How long does the relining process take? It’s usually finished within a couple of hours and almost always finished within a day. Can I use my water facilities during the relining process? Yes! That’s one of the many benefits of the drain relining process. There’s minimal effect on your day-to-day living. How long will a relined drain last? We’d like to say forever and we’d be pretty close if we did. The relining material has a life expectancy of over 30 years. Yes, all our relining work comes with 15 years guarantee. Will drain relining cause much damage or mess to my property? This is one of the biggest benefits of pipe relining – in over 80% of cases, we don’t need to dig! That means we won’t need to rip up your garden bed or driveway and there’ll minimal (if any) impact on your property. We leave it the way we find it. How strong is the material used for relining? Extremely strong. The resin used is stronger than the original pipe. Can tree roots penetrate the relined drain? The shape & material of the reline ensures that there’s no way a tree root could enter meaning drain relining is 100% guaranteed against tree roots. Fast is our middle name. We have plumbers on standby 24/7 throughout Melbourne & suburbs so we can get to your within 1 hour. Our drainage & pipe relining services are the best in Melbourne. We can fix any blocked drain and we don't even have to dig! Running out of hot water too quickly? Or just sick of cold showers? Give us a call and we'll help you assess if something's wrong. 90% of the time, we can fix your existing tapware without having to replace it - meaning we can save you money. We had just moved into our newly built house and our backyard was constantly wet and muddy. We got in contact with our builder who sent his plumbers out however they said everything was ok and they couldn't find the problem. We left it for a month and it was getting worse so we got in touch with Revive A Drain the plumber was there with in 40mins of us calling and had cleared the blocked drain within the hour also identifying that the drain was collapsed in the footpath and the builder is responsible as the house is only a week old. We were very happy with the service and honesty highly recommended. Revive a Drain completed our upstairs bathroom renovation. We found Aaron from Revive A Drain to be very professional and prompt and we were very happy with the end result. Since Revive a Drain has renovated our upstairs bathroom we have used them on a number of occasions for smaller plumbing jobs around the house. The fastest way to make a booking is by calling us on 1300 021 425. But if you’d prefer to book an appointment online, fill out the inquiry form here and we’ll get back to you as soon as possible.